PCOS Indian Recipes, Polycystic Ovary Syndrome Veg recipes. In India, we all enjoy other cuisines like Italian, Chinese, etc. but let's not forget our indigenous cuisine which is filled with warm aromatic spices and provides bursts of flavour! With Indian restaurants mushrooming all over the world, Indian cuisine is being lauded everywhere now. Contrary to the general impression that Indian food is loaded with fat and oil, we have given you a lot of options that are high in fibre and low in GI. These will meet your nutritional needs while also helping weight loss. High-fibre cereals such as bajra, wheat, jowar and oats can be included in your diet in the form of Bajra, Carrot and Onion Uttapa, ragi upma recipe, moong dal and spinach idli recipe for breakfast or Oats Mooli Roti for lunch. Try our vegetable recipes like Cucumber and Mixed Sprouts Subzi and Baingan Methi ki Subzi for an added dose of antioxidants and fibre. Masala chawli recipe, Doodhi and chana dal sabzi, diabetic and eye friendly carrot methi sabzi and low carb cabbage foogath are some great options. Have a go at healthy tikki recipes like Moong Sprouts and Spring Onion Tikki and Cauliflower and Oats Tikki, which are sure to tickle your taste buds. 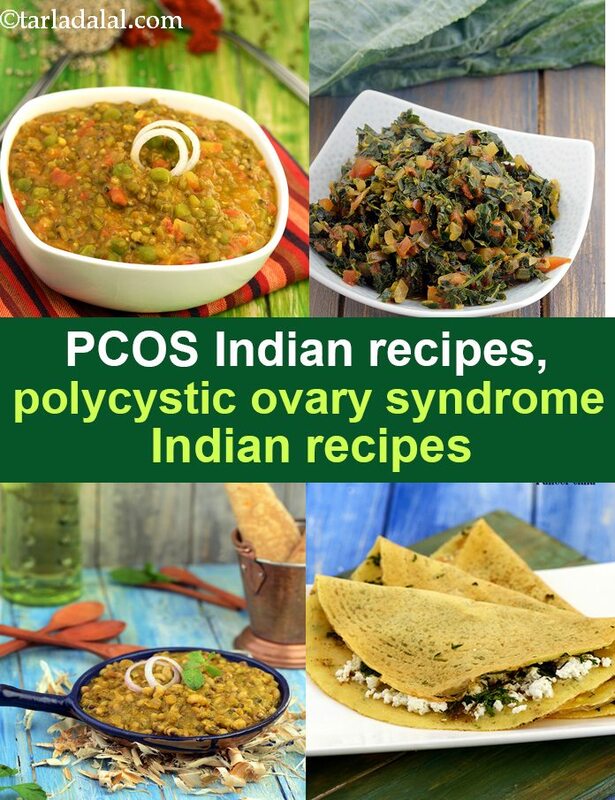 Enjoy our PCOS Indian Recipes, Polycystic Ovary Syndrome Veg recipes and other PCOS recipe articles below.